The Gippsland Lakes are the largest estuarine coastal lagoon system in Australia, providing a myriad of values to the community and environment, including tourism, agriculture, habitat and cultural heritage. The lakes have a combined surface area of about 360 km², and are the receiving waters for 6 major rivers with a total catchment area of over 20,000 km². The Lakes consists of 3 main interconnected lakes with inter-connecting channels, and are open to Bass Strait via an artificial entrance at Lakes Entrance. 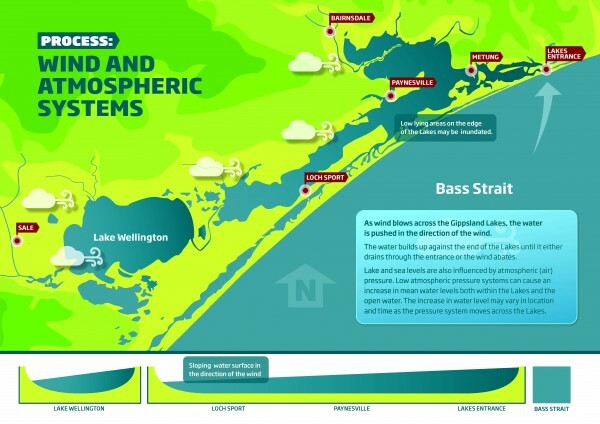 Water Technology is proud to have contributed to numerous studies on the Gippsland Lakes, covering algal blooms, salinity, and coastal hazards such as erosion and flooding (soon to be available). This work has been in collaboration with various groups, including Monash University, the Gippsland Lakes Ministerial Advisory Committee, the Department of Environment and Primary Industries and community groups. 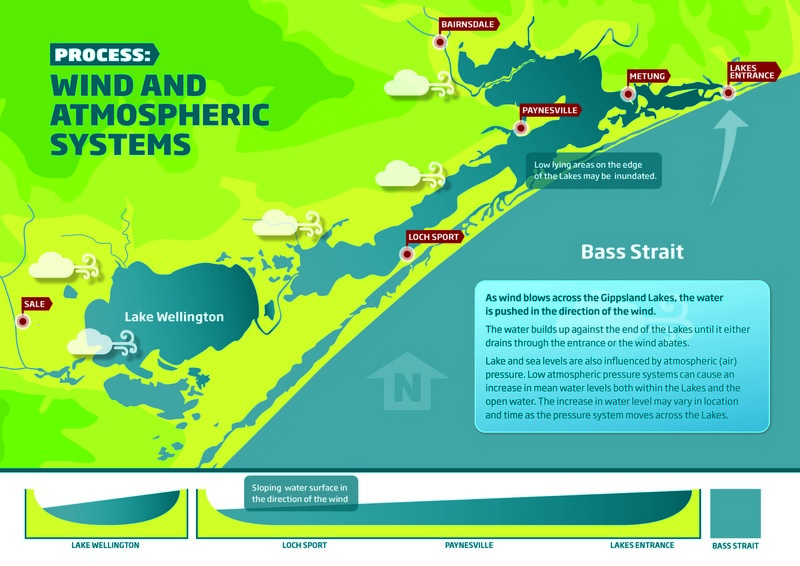 Gippsland Lakes are a complex and diverse network of interconnecting waterbodies and channels. The Gippsland Lakes have suffered recurrent summer toxic blooms of cyanobacterium Nodularia spumigena since 1985. Diatoms and dinoflagellates are also common bloom formers seen in the lakes. 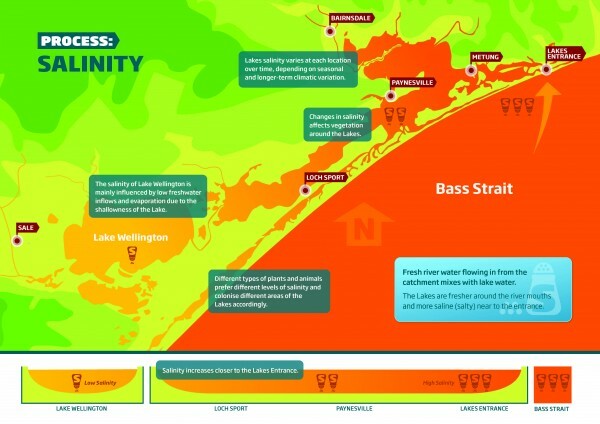 The key drivers of the blooms include intermediate salinity, stratification, bottom water hypoxia and sediment phosphorus release that are broadly well understood. This project sought to develop a quantitative tool to predict blooms and explore management options to mitigate blooms. The outcomes of this project will assist agencies responsible for managing the lakes to develop strategies relating to water quality, amenity, tourism and public health. As part of the project, coupled hydrodynamic biological-ecological models for toxic cyanobacteria in the Gippsland Lakes were investigated. The outputs of these investigations have been designed to inform the community. This diagram shows the outputs of the model which reproduces the hydrodynamics and replicated the spatial and temporal distributions of Nodularia blooms. 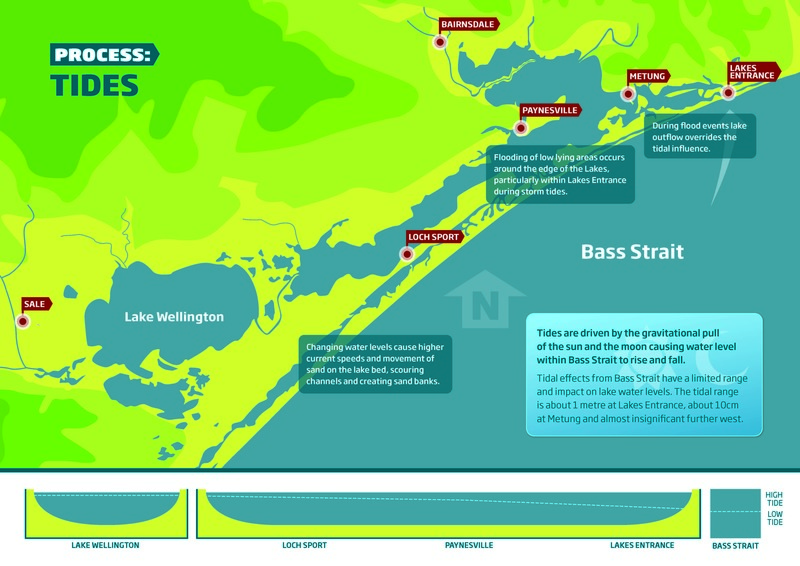 The Gippsland Lakes have been permanently connected to Bass Strait via an artificial entrance since 1886. Prior to this time the lakes were only intermittently open to the sea. 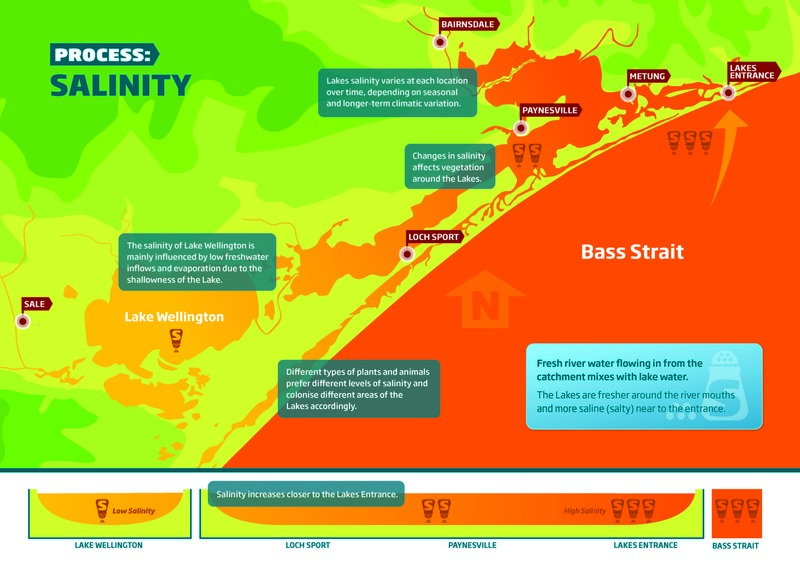 Increasing salinity levels in the lake have been a concern for the local community for some time, and a study was undertaken to look at factors causing salinity within the lakes. Salinity was impacting on local vegetation communities, with considerable vegetation die back occurring. 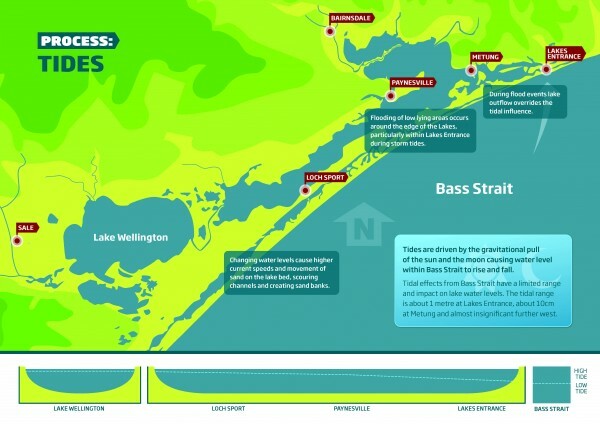 Our research investigated these issues and produced the following four diagrams to show what is occurring in the Gippsland Lakes. Heavy rainfall in the catchments flows down the rivers and into the Gippsland Lakes. The flood water increases levels in the Lakes, often remaining high for a number of days. These floods supply the lakes with fresh water which is high in sediments and nutrients. Tides are driven by the gravitational pull of the sun and the moon causing water level within Bass Strait to rise and fall. Research discovered that tidal effects from Bass Strait have a limited range and impact on lake water levels. The tidal range is about 1 metre at Lakes Entrance, 10cm at Metung, and almost insignifcant further west. Fresh river water flowing in from the catchment mixes with lake water. The Lakes are fresher around the river mouths and more saline (salty) near to the entrance. Overall, the study found that the substantially reduced river flows during droughts in the late 1990’s and 2000’s were the cause with a lack of fresh-water input to the lakes. 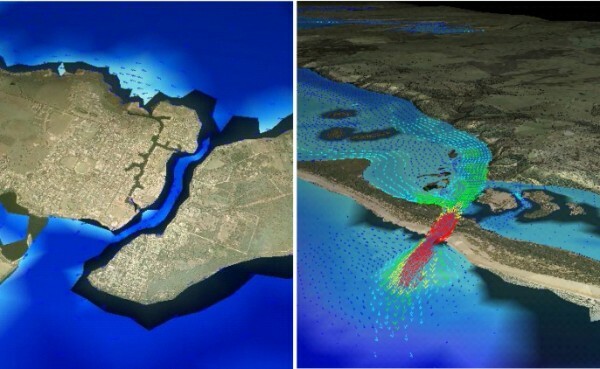 Water Technology was commissioned by the Department of Environment and Primary Industries to identify and assess the coastal processes and coastal hazard issues for the Gippsland Lakes and Ninety Mile Beach coastal system. Existing geomorphic and hydrodynamic processes operating in the study area were reviewed. 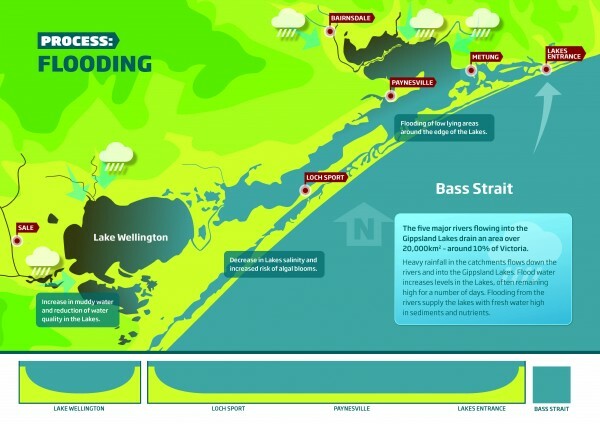 Coastal erosion, shoreline recession, storm surge inundation, and sea level rise scenarios were assessed, including the vulnerability of the outer dune barrier to a breach. The area was assessed as a whole and four critical locations were assessed in greater detail. 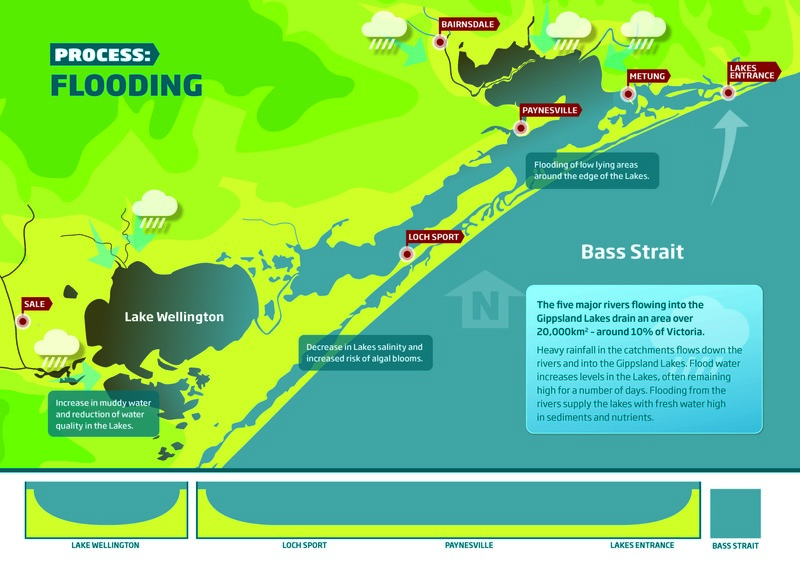 Recommendations were made for further coastal monitoring to enable an ongoing assessment of coastal change or stability. 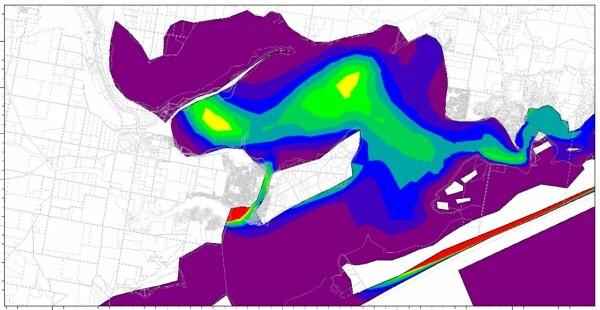 Modelling hydrodynamic processes in the Gipplsand Lakes. As these projects demonstrate, Water Technology is a specialist consultancy offering high-level services in the fields of coastal/estuary dynamics, surface water hydrology/hydraulics, floodplain management, geomorphology, waterway management and ecology. The company was formed in 2000 with a commitment to providing technical excellence in the delivery of investigations in coastal, water resources and natural resource management fields. Please get in touch with us if we can assist you in your wetland and river work.